between high-end investment/financial planning and high-end insurance advice. We find that more recently priced products on the market can improve the benefits or costs of most insurance policies. Let us take a look for you. As an advisor, you know when something doesn’t look right. If your client owns a policy with design, structure, or ownership issues, contact our team for an analysis. Estate liquidity and succession planning often involve a great deal of insurance. Designs and products can be complicated and confusing. We can explore these concerns with you. If you’d like more insight into the health of your client’s insurance situation, fill out this form. We can help you serve your people better. Our Experts Are Connecting Advisors and Insurance Across the Nation. The above map is not representative of the location of any person listed nor does it imply registration in any particular state. The individuals listed are meant to represent a sample of the subject matter experts that work in relation with Bridge Partners. 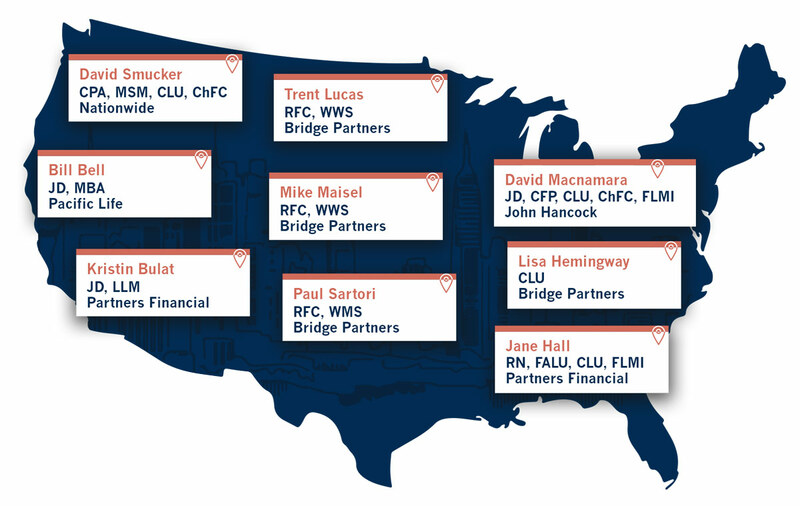 Not all individuals listed are employed by Bridge Partners nor is this sample an exhaustive list of the employees or affiliates of Bridge Partners. Bridge Partners is not the issuing entity of any insurance that may be received through working with Bridge Partners. Product availability and features may vary by state.